Whether it is your first time renting or not, it can be difficult to determine what you should be looking for when it comes to your apartment search. There are a lot of factors to consider, and this is why we’ve put together a checklist for you to bring with you when you start your search. The checklist we’ve designed helps you to keep track of what the apartment includes, and provides you with a way to compare different properties all at once. We have also included insider tips on the obvious and the not-so obvious things you should be looking for when you visit a property. 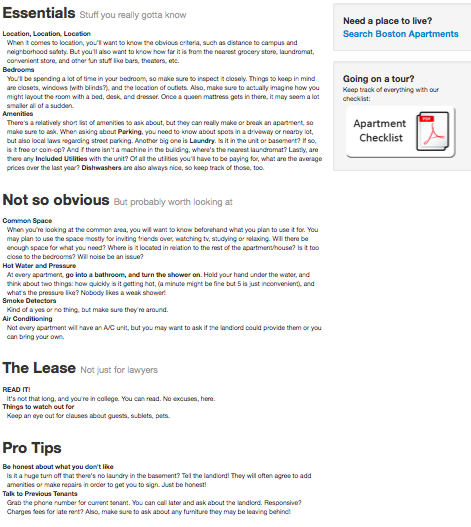 A checklist like this is a useful tool when you start your apartment search. You should never rent an apartment based on appearance only, and you should never rent an apartment just based on photographs. We always suggest that you actually visit the listing before you sign on the dotted line. It is important that you make sure that the property is exactly as it was listed and that it fits your needs. To download a copy of our checklist and to view other tips on apartment hunting, go to http://jumpoffcampus.com/resources/checklist. If you are looking to sublet a place for the summer, there are some important things you need to consider. 1. Know what you’re looking for. When you start your search, you want to have an idea of what you would want in a sublet. In a blog post we read by Kathleen Corlett at HerCampus.com, there are some important questions you want to ask yourself. Is your ideal sublet furnished or unfurnished? Is it in walking distance to your work or near a bus stop? Do you have roommates? Do you have your own bedroom? Corlett even suggests putting together a checklist to compare them side-by-side. 2. Be flexible. In a blog post we read by Juliet O’Reilly on GradGuard.com, she suggests keeping an open mind when looking at sublets, as a place may not be exactly what you had envisioned, but it may offer you more opportunities than you had expected. 3. Cover all ground. O’Reilly advises that while you don’t want to get overwhelmed in your search, you want to be sure that you are looking at all of the opportunities and not limiting yourself. 4. When you find an ad you like, make sure to get all the info. Ask for more photos and more information on the rental first before you go to see it. That way you won’t waste your time viewing a place that won’t fit your needs. 5. Review crime statistics for the area. If you don’t know the area very well, you want to be sure that you look at the crime rates for an area. You want to be sure that the place you live is safe. 6. Narrow it down. Narrow your search down to a few places your like the most. These will be the places that you want to tour. You may also want to be sure to have a few backups just in case the places you see don’t work out or aren’t what you are looking for. 7. Check out your top picks. You don’t want to sign a lease before you’ve seen the place for yourself. 8. Choosing a place. Make sure you choose the place that fits your needs best and is somewhere you can see yourself living. 9. Make sure you read the sublease carefully before signing. You want to know what you are committing to, if there are any special rules, or if you need clarification on something. 10. When you move in, make sure to take time-stamped photos of the place. This will prevent you from getting stuck with the bill if there are any damages. 11. Collect all the contact information for the person you are subletting from. You want to be sure to get all this information before they leave so that you have some way of contacting them. When should I start looking for an apartment?! With the summer finally here, at JumpOffCampus we have been trying to get a feel for the housing search process and see when students really begin their search. While the sublet market for summer housing is a rather quick process where you can find an apartment one day and basically move in the next, the search for year round housing is usually a more involved process. We saw an article (http://www.miamistudent.net/news/students-rush-to-find-off-campus-housing-1.2855045#.T6lQpehSSxg) about students at Miami University and how their housing search is getting a bit crazy. Students at Miami have had a difficult time finding enough off campus housing for the population. Because of the shortage of on campus housing, they feel rushed to sign leases up to 18 months in advance in order to beat the crowd! Students at Miami University are required to live on campus their first two years, and they often sign leases for apartments as freshman. One group of students when they were signing their lease even had students knocking on their door yelling that they would pay double. There also were students calling and claiming the 2014-2015 school year already for their house! So what does this situation at Miami University say about the off campus housing process? The search for off campus housing is definitely not always enjoyable. It is stressful, time consuming, and often times you feel like you are just spinning your tires without getting anywhere. In the case of Miami University, the students there have felt so much pressure to get housing early, that they rush to sign leases school years in advance and once they sign they often regret it, because they have no idea what they are going to be doing two years from now or who their friends will be and whether they just made a good decision or not. What can we learn from this case about how to go about the upcoming fall semester housing search? Well, the first thing is to definitely start early (although Miami students may be forced to start a little too early). It is important to plan ahead of time and try to secure something, but there is no reason to feel pressure to sign something without fully thinking about it. You should try and stay ahead of the game, but keep in mind, there is never just one ideal option out there. If you know where to look, you will find that perfect apartment. You don’t need to take the first one that comes your way just to get the process over with. It also is important to know where to look. That’s where we come in! We have now made it easy to sign up for JumpOffCampus without having an affiliated school. That means that even if your school does not use our service or endorse it on the school website, you can still sign up and see what apartments might be around your area! Also, if you are looking for a sublet, anyone from any school can see them too! Lastly, it is important to work with the landlords and make sure the lease is exactly how you want it. Make sure it is very detailed and that it covers everything you need in order to protect yourself (we will talk more about this in an upcoming post) and that any verbal changes that are made to the lease are written down and amended. If the lease doesn’t address things you feel it should, then speak up!